Have you ever tried to make a cake and you don’t have all the ingredients necessary? You start to improvise and what results usually isn’t something desirable. It may be tasty, but it’s not what you intended. Recently, I tried to make a cinnamon crumb cake. Instead of using butter, I decided to go lower fat and use margarine. We’ve been trying to use butter around here for health reasons, but this one time I thought it would be fine to substitute. Well, what happened to the cake I made was that instead of a crumbly cinnamony filling inside of it, I got a cinnamon swirl because of the oil content of the margarine. A few days later I made the cake with butter instead. The difference was not in the taste so much but definitely in how it looked and felt in your mouth. A crumbly crunchy treasure instead of a creamy swirl. If you take all the ingredients that you’d use to make a cake and look at them individually, very few of them are tasty by themselves. No one wants to eat shortening or drink vegetable oil. “Yuck” is what you would say if you put a spoonful of flour into your mouth. 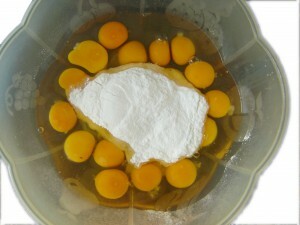 The same goes for vanilla extract or any other kind of extract or raw eggs. They are simply gross by themselves. Sugar and salt are flavorful but you surely wouldn’t sit and eat them by themselves in large quantities. And cinnamon doesn’t have near the flavor it does alone as it does when it’s mixed with sugar. If you don’t follow the instructions for a recipe, sometimes ingredients get mixed in too soon and certain things don’t mesh and the recipe can fail. Here’s a Pinterest example. So what does this have to do with life? Well, recently at our church we had message about the ingredients that make up our lives. Certain ingredients are not particularly tasteful or easy to swallow. Some are ones we’d prefer to leave out all together. Sometimes we rush things and put ingredients into our lives before it’s time to do so. Sometimes we avoid adding them at all. What results is not what was intended by the Master Chef in our lives. Would I have wanted to experience several job losses over the years? The losses of loved ones we’ve had? The medical bills and car repairs that have left us flat broke? The multiple rejections I’ve received from publishers and the wait I still must go through? No! By nature, since I’m human, I’d really only want to experience the good things in life. I’d want a beautiful cake without having to put in the ingredients that aren’t so tasty by themselves. But the truth is: these things in life are what make us who we are. They are what prepare us for the ministry opportunities God has for us. We are all individuals and even though many things in our lives may parallel with others, we’re unique and created for a unique purpose. So the experiences I’ve been through have given me material to write about and speak about and they have given me what I need to be able to help others through similar situations. The pastor who preached this message left us with a question: Will you be a victim or a vessel? Like it says in Proverbs 25:4, “Remove the dross from the silver, and a silversmith can produce a vessel.” When these undesirable ingredients (not so good by themselves) get mixed into our lives and we allow God to teach us the lesson he has for us and to burn away the things that don’t need to stay there, we allow Him to do great things with us. To make us into beautiful masterpieces. We become vessels of testimony instead of victims of our circumstances. 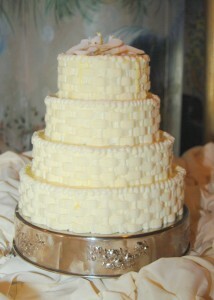 We become beautiful Bride’s cakes for the biggest Wedding of all! So what kind of cake do you want to bake today? Wonderful message. God ministered this to me a while back and it is so true. My father used to say that if you changed one thing in your life, whether it was good or bad, you wouldn’t be the person you are right now. God mixes everything together for our good. Thanks for sharing. Beth, I love that comment from your dad. So true!! “But the truth is: these things in life are what make us who we are. They are what prepare us for the ministry opportunities God has for us.” Thank you for encouraging with your beautiful post!